What's ahead on Microsoft's Office 365 roadmap? Office 365 has always been the way for businesses to get new features in Office regularly, both for the online services like Exchange and OneDrive for Business, and for the Office programs like Excel and Outlook. Now consumer Office 365 subscriptions will also get new Office features – the first is likely to be more chart types in Excel 2016 and a new presentation experience for PowerPoint 2016, as well as objects automatically animating between slides. 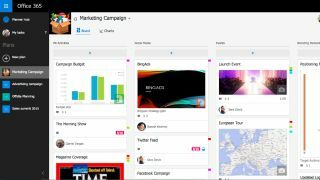 Office Online also has updates on the way, namely the ability for Excel Online to open spreadsheets with Power View reports in and create Pivot Tables, and Outlook.com is getting Facebook-style Like buttons and notifications when you're mentioned in a message. If you want to stay on top of what's coming soon for Office 365, the Office blog will make major announcements, but you'll also want to keep an eye on the Office 365 roadmap – which also covers Office Online and Outlook.com. If the Office blog is going to cover a feature, the news will be there first, but smaller features may only be covered in the roadmap. The Uservoice forums for Office 365 and for Word, Excel and PowerPoint mark the suggestions Microsoft is considering or has decided to build with tags like 'under review, 'planned', 'started' and 'completed'. For example, work has already started on letting Mac users customise the Office ribbon the way you can on Windows, and on improving the concatenation function. One Microsoft product manager on the site says "our plan is respond to every suggestion that gets at least 20 votes" so once the Uservoice sites become more widely used, they should be a useful place to check on future plans. There's an Outlook Uservoice section on the way too. Furthermore, bear in mind that in amongst all the tips and support requests at https://www.facebook.com/Office there are sometimes discussions and votes on new features. If you have an Office 365 enterprise account, you can also join the First Release program to get early access to new features; that would have let you try out Clutter several months before it was turned on for all users. You can use First Release to give everyone in your company access to new features as they come along, or nominate specific people to try them out first, so they can assess them or be ready to support everyone else.